This recipe is a very popular five-star dinner that allows you to easily get your daily serve of vegetables. With fennel, capsicum, onion, carrot and tomato, this recipe is packed with vegetables and healthy goodness. A little basil and chili flakes give this recipe a delicious flavour. Share the moment #youplateit with us on Instagram. Wash the fresh produce. Medium dice the fennel, ¾ of the onion and carrot. Peel and mince the garlic. Heat a medium pot of salted water to boiling on high. Pick basil leaves (discarding stems). Slice the roasted capsicum into strips. Heat a drizzle of oil in a pot over medium heat. Add the fennel, onion and carrot and cook for 6 - 8 minutes until softened, stir frequently. Stir in the garlic, ground fennel & chili flakes and tomato paste, cook for 2 minutes. 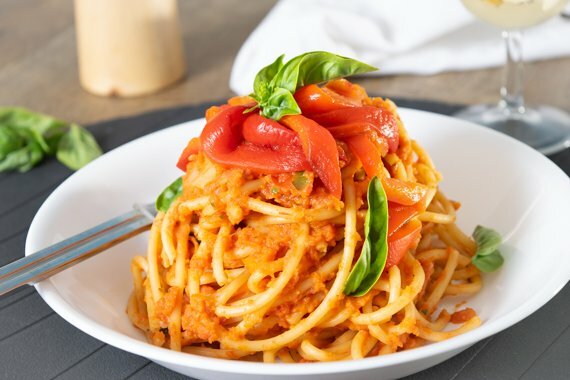 Add ¾ the diced tomatoes (you will have some left over), ½ the capsicum, vege stock concentrate, basil leaves (reserving some for garnish), 100mL water and ½ teaspoon sugar (optional). Reduce heat to low. Simmer, uncovered, for 10 minutes or until the vegetables are completely soft. In the meantime, add the bucatini pasta to the pot of boiling water. Cook 7 to 9 minutes, or until just shy of al dente. Drain thoroughly. Set aside. Take out a couple of spoonfuls of the sauce (this will add texture later), then blend the rest in the pot until almost smooth with a stick blender (Tip: If you don't have a stick blender just skip this part). (Note: be careful that the sauce doesn't splatter over you). Stir in reserved sauce. Taste and adjust seasoning as required. Add Bucatini pasta to the sauce and toss to coat. Divide the pasta between plates and top with reserved capsicum and basil leaves. Enjoy!